I first played Boomshine a few years ago as a Flash game. At the time, I thought the game was utterly brilliant and one of my favorite browser games. It was one of those bafflingly simple games that is also incredibly absorbing and addictive. A bit rough around the edges, but that certainly didn’t stop me from playing it for hours, so naturally, I was thrilled to find it available as an app. Boomshine is a very simple chain-reaction game. Multi-colored dots are careening about the screen, and your goal is to burst as many of them as you can. This means touching the screen once, at just the right time and place, to set the explosions in motion. 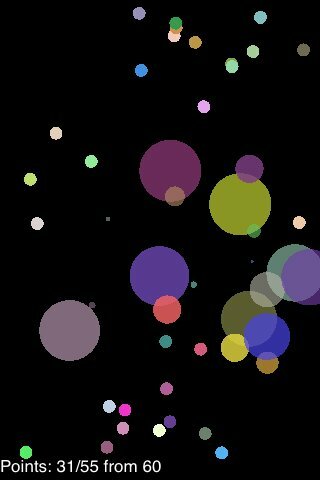 Dots burst into a big circle if they touch an already popped dot, but they fade away soon after that, so if you’ve done it just right, you’ll have tons of bright circles followed by a mostly empty screen. The graphics, in case you couldn’t tell from my vivid description of the dots, are pretty lackluster. The colors are pretty enough, and you get a lot of satisfaction out of seeing your screen explode into a rainbow, but they’re just circles when all is said and done. The sound effects and music fare much better, with a wonderfully soothing piano score running in the background. Boomshine definitely exudes a lot of unpolished charm, which is great for a free Flash game, but it doesn’t hold up quite as well for a paid app. The $0.99 price tag isn’t going to break the bank, but it may be a little off-putting for those used to the free online version. It’s also not a very long game, which some may find disappointing. It is perfectly possible to finish the game in less than 10 minutes, although you’ll probably just want to play it all over again anyway. All other considerations aside, Boomshine is an exceptionally addictive game, an true eater of time. I personally don’t think more levels are needed, but I would have liked difficulty ratings and the ability to revisit levels individually. While I think it probably deserves a more professional finish, I really enjoyed Boomshine a lot and think it is phenomenally well-suited to the iPhone. Like ripples in a pond, there’s an profound sense of satisfaction in seeing the effects of a single touch. Rather like Auditorium, Boomshine is more a lovely and soothing audiovisual experience than a game, but it’s one you’re sure to enjoy over and over again. AppSafari review of Boomshine was written by Tracy Yonemoto on April 22nd, 2010 and categorized under App Store, Fun, Games, Music, Physics Based. Page viewed 4106 times, 1 so far today. Need help on using these apps? Please read the Help Page.